The Beatles changed the course of music history. There is no doubt about that. From their humble beginnings in Liverpool to their massive success between 1963 and 1970, The Beatles became the most influential quartet of musicians in the world. Though some may disagree, The Beatles have even eclipsed Elvis in terms of popularity over the years. Elvis may have kick started Rock ‘n’ Roll, but he managed to lose the plot when he churned out loads of b-movies in the ‘60s. The Beatles never had the opportunity to overstay their welcome. They came, wrote some of the most amazing tunes ever, changed the world and then broke up. The Beatles’ story is known by anyone with a passing interest in music. There are hundreds (if not thousands) of books written about the Fab Four. Their songs are played 24 hours a day somewhere in the world. Beatles fans have taken it upon themselves to set up websites totally devoted to John, Paul George and Ringo, either together or apart. It seems, at times, that you can’t escape their influence, whether it’s musically or in pop culture. The Beatles are everywhere. But have we really heard all we need to know about The Beatles? Judging by the new documentary, Beatles Stories, there is plenty more to tell. 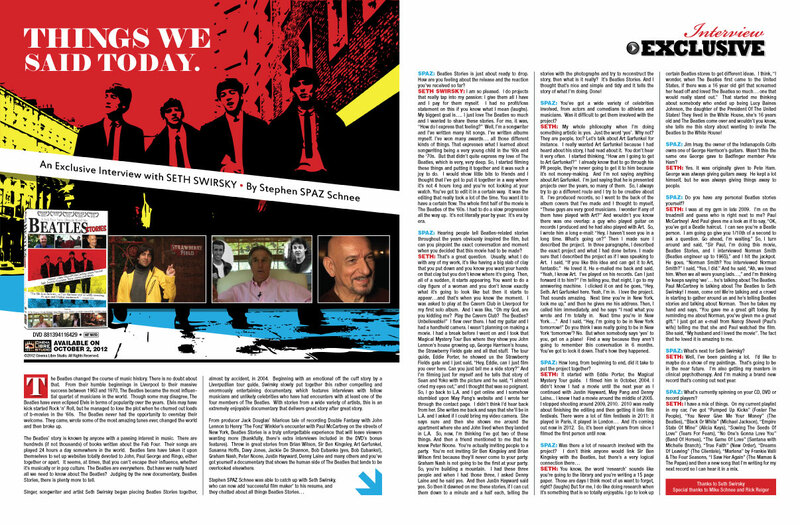 Singer, songwriter and artist Seth Swirsky began piecing Beatles Stories together, almost by accident, in 2004. Beginning with an emotional off the cuff story by a Liverpudlian tour guide, Swirsky slowly put together this rather compelling and enormously entertaining documentary, which features interviews with fellow musicians and unlikely celebrities who have had encounters with at least one of the four members of The Beatles. With stories from a wide variety of artists, this is an extremely enjoyable documentary that delivers great story after great story. From producer Jack Douglas’ hilarious tale of recording Double Fantasy with John Lennon to Henry ‘The Fonz’ Winkler’s encounter with Paul McCartney on the streets of New York, Beatles Stories is a truly unforgettable experience that will leave viewers wanting more (thankfully, there’s extra interviews included in the DVD’s bonus features). Throw in great stories from Brian Wilson, Sir Ben Kingsley, Art Garfunkel, Susanna Hoffs, Davy Jones, Jackie De Shannon, Bob Eubanks (yes, Bob Eubanks! 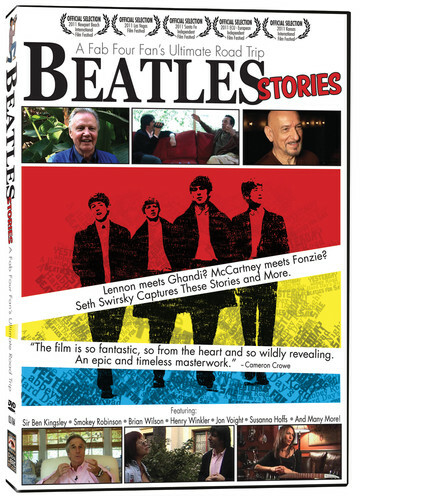 ), Graham Nash, Peter Noone, Justin Hayward, Denny Laine and many others and you’ve got yourself a documentary that shows the human side of The Beatles that tends to be overlooked elsewhere. 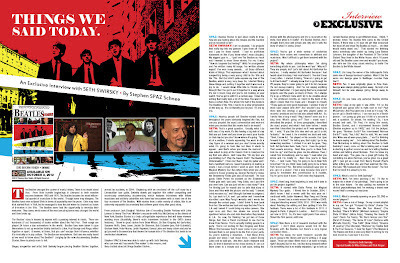 SPAZ: Beatles Stories is just about ready to drop. How are you feeling about the release and the reaction you’ve received so far? SETH SWIRSKY: I am so pleased. I do projects that really tap into my passion: I give them all I have and I pay for them myself. I had no profit/loss statement on this if you know what I mean (laughs). My biggest goal is…. I just love The Beatles so much and I wanted to share these stories. For me, it was, “How do I express that feeling?” Well, I’m a songwriter and I’ve written many hit songs. I’ve written albums myself. I’ve won many awards… all those different kinds of things. That expresses what I learned about songwriting being a very young child in the ‘60s and the ‘70s. But that didn’t quite express my love of The Beatles, which is very, very deep. So, I started filming these things and putting it together and it was such a joy to do. I would show little bits to friends and I thought that I’ve got to put it together in a way where it’s not 4 hours long and you’re not looking at your watch. You’ve got to edit it in a certain way. It was the editing that really took a lot of the time. You want it to have a certain flow. The whole first half of the movie is The Beatles of the ‘60s. I had to do a slow progression all the way up. It’s not literally year by year. It’s era by era. SPAZ: Hearing people tell Beatles-related stories throughout the years obviously inspired the film, but can you pinpoint the exact conversation and moment when you decided that this movie had to be made? SETH: That’s a great question. Usually, what I do with any of my work, it’s like having a big slab of clay that you put down and you know you want your hands on that clay but you don’t know where it’s going. Then, all of a sudden, it starts appearing. You want to do a clay figure of a woman and you don’t know exactly what it’s going to look like but then it starts to appear…and that’s when you know the moment. I was asked to play at the Cavern Club in Liverpool for my first solo album. And I was like, “Oh my God, are you kidding me? Play the Cavern Club? The Beatles? Unbelievable!” I flew over there. I had my guitar and I had a handheld camera. I wasn’t planning on making a movie. I had a break before I went on and I took that Magical Mystery Tour Bus where they show you John Lennon’s house growing up, George Harrison’s house, the Strawberry Fields gate and all that stuff. The tour guide, Eddie Porter, he showed us the Strawberry Fields gate and I just said, “Hey, Eddie, can I just film you over here. Can you just tell me a side story?” And I’m filming just for myself and he tells that story of Sean and Yoko with the picture and he said, “I almost cried my eyes out,” and I thought that was so poignant. So, I go back to L.A. and I get online and I somehow stumbled upon May Pang’s website and I wrote her through the contact page. I didn’t think I’d hear back from her. She writes me back and says that she’ll be in L.A. and I asked if I could bring my video camera. She says sure and then she shows me around the apartment where she and John lived when they landed in L.A. So, now, I’m thinking I’ve got two of these things. And then a friend mentioned to me that he knew Peter Noone. You’re actually inviting people to a party. You’re not inviting Sir Ben Kingsley and Brian Wilson first because they’ll never come to your party. Graham Nash is not going to be the first at your party. So, you’re building a mountain. I had these three people and when I had those three, I asked Denny Laine and he said yes. And then Justin Hayward said yes. So then it dawned on me: these stories, if I can cut them down to a minute and a half each, telling the stories with the photographs and try to reconstruct the story, then what is it really? It’s Beatles Stories. And I thought that’s nice and simple and tidy and it tells the story of what I’m doing. Done! SPAZ: You’ve got a wide variety of celebrities involved, from actors and comedians to athletes and musicians. Was it difficult to get them involved with the project? SETH: My whole philosophy when I’m doing something artistic is: yes. Just the word ‘yes’. Why not? They are people, too? Let’s talk about Art Garfunkel for instance. I really wanted Art Garfunkel because I had heard about his story, I had read about it. You don’t hear it very often. I started thinking, “How am I going to get to Art Garfunkel?” I already know that to go through his PR people, they’re never going to get it to him because it’s not money-making. And I’m not saying anything about Art Garfunkel. I’m just saying that he is presented projects over the years, so many of them. So, I always try to go a different route and I try to be creative about it. I’ve produced records, so I went to the back of the album covers that I’ve made and I thought to myself, “These guys are very good musicians. I wonder if any of them have played with Art?” And wouldn’t you know there was one overlap: a guy who played guitar on records I produced and he had also played with Art. So, I wrote him a long e-mail: “Hey, I haven’t seen you in a long time. What’s going on?” Then I made sure I described the project. In three paragraphs, I described the exact project and what I had done before. I made sure that I described the project as if I was speaking to Art. I said, “If you like this idea and can get it to Art, fantastic.” He loved it. He e-mailed me back and said, “Yeah, I know Art. I’ve played on his records. Can I just forward it to him?” I’m telling you, that night, I go to my answering machine. I clicked it on and he goes, “Hey, Seth. Art Garfunkel here. Yeah, I’m in. I love the project. That sounds amazing. Next time you’re in New York, look me up,” and then he gives me his address. Then, I called him immediately, and he says “I read what you wrote and I’m totally in. Next time you’re in New York….” And I said, “Hey, I’m going to be in New York tomorrow!” Do you think I was really going to be in New York ‘tomorrow’? No. But when somebody says ‘yes’ to you, get on a plane! Find a way because they aren’t going to remember this conversation in 6 months. You’ve got to lock it down. That’s how they happened. SPAZ: How long, from beginning to end, did it take to put the project together? SETH: It started with Eddie Porter, the Magical Mystery Tour guide. I filmed him in October, 2004. I didn’t know I had a movie until the next year as I continued with Justin Hayward, May Pang and Denny Laine... I knew I had a movie around the middle of 2005. I stopped shooting around 2009, 2010. 2010 was really about finishing the editing and then getting it into film festivals. There were a lot of film festivals in 2011: it played in Paris, it played in London… And it’s coming out now in 2012. So, it’s been eight years from since I filmed the first person until now. SETH: You know, the word ‘research’ sounds like you’re going to the library and you’re writing a 15 page paper. Those are days I think most of us want to forget, right? (laughs) But for me, I do like doing research when it’s something that is so totally enjoyable. I go to look up certain Beatles stores to get different ideas. I think, “I wonder, when The Beatles first came to the United States, if there was a 16 year old girl that screamed her head off and loved The Beatles so much… one that would really stand out.” That started me thinking about somebody who ended up being Lucy Baines Johnson, the daughter of the President Of The United States! They lived in the White House, she’s 16 years old and The Beatles come over and wouldn’t you know, she tells me this story about wanting to invite The Beatles to the White House! SPAZ: Jim Irsay, the owner of the Indianapolis Colts owns one of George Harrison’s guitars. Wasn’t this the same one George gave to Badfinger member Pete Ham? SETH: Yes. It was originally given to Pete Ham. George was always giving guitars away. He kept a lot himself, but he was always giving things away to people. SPAZ: Do you have any personal Beatles stories yourself? SETH: I was at my gym in late 2009. I’m on the treadmill and guess who is right next to me? Paul McCartney! And Paul gives me a look as if to say, “OK, you’ve got a Beatle haircut. I can see you’re a Beatle person. I am going go give you 1/10th of a second to ask a question. Go ahead, I’m waiting.” So, I turn around and said, “Sir Paul, I’m doing this movie, Beatles Stories, and I interviewed Norman Smith (Beatles engineer up to 1965),” and I hit the jackpot. He goes, “Norman Smith? You interviewed Norman Smith?” I said, “Yes, I did.” And he said, “Ah, we loved him. When we all were young lads…,” and I’m thinking he keeps saying ‘we’… he’s talking about The Beatles. Paul McCartney is talking about The Beatles to Seth Swirsky! I mean, come on! We’re talking and a crowd is starting to gather around us and he’s telling Beatles stories and talking about Norman. Then he takes my hand and says, “You gave me a great gift today. By reminding me about Norman, you’ve given me a great gift.” I just got an e-mail from Nancy Shevell (Paul’s wife) telling me that she and Paul watched the film. She said, “My husband and I loved the movie”. The fact that he loved it is amazing to me. SPAZ: What’s next for Seth Swirsky? SETH: Well, I’ve been painting a lot. I’d like to maybe do a show of my paintings. That’s going to be in the near future. I’m also getting my masters in clinical psychotherapy. And I’m making a brand new record that’s coming out next year. SPAZ: What’s currently spinning on your CD, DVD or record players? SETH: I have a mix of things. On my current playlist in my car, I’ve got “Pumped Up Kicks” (Foster The People), “You Never Give Me Your Money” (The Beatles), “Black Or White” (Michael Jackson), “Empire State Of Mind” (Alicia Keys), “Sowing The Seeds Of Love” (Tears For Fears), “No One’s Gonna Love You” (Band Of Horses), “The Game Of Love” (Santana with Michelle Branch), “True Faith” (New Order), “Dreams Of Leaving” (The Clientele), “Marlena” by Frankie Valli & The Four Seasons, “I Saw Her Again” (The Mamas & The Papas) and then a new song that I’m writing for my next record so I can hear it in a mix.